Kawamono: Kawamono Innovation 2017 ! Sigup Member Benefit : Purchase over € 25 / $ 26.6 will get 12% off Discount. 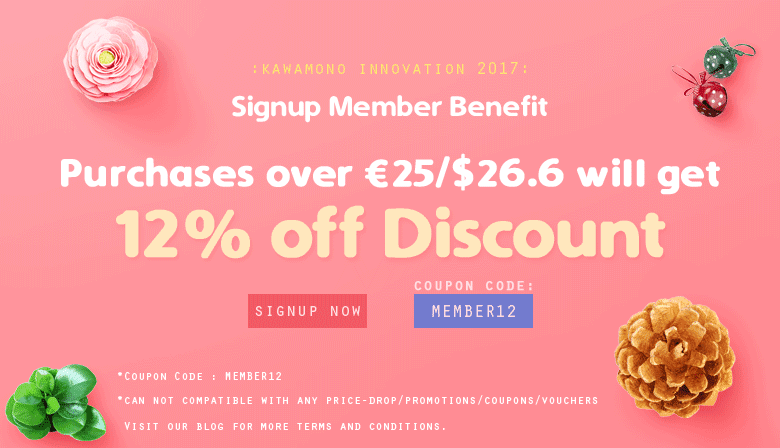 Kawamono Innovation 2017 ! Sigup Member Benefit : Purchase over € 25 / $ 26.6 will get 12% off Discount. Sign up Member Benefit :Purchase over € 25 / $ 26.6 will get 12% off Discount. For Kawamono.com Registered Member Only. This Coupon can not compatible with any promotion / coupon / voucher. This Coupon can not be used in conjunction with existing "Price-Drop / Discounted" prices. Purchases worth €25 / $26.6 will get 12% off Discount. Applicable towards product prices only, and cannot be applied to shipping or reshipping charges. Kawamono.com reserves the right to change all terms and conditions and to withdraw this offer without prior notice. Should there be any disputes, Kawamono’s decision is final. "Welcome voucher" is no longer available and will be replaced by this "Member Benefit".